Amazon is world`s largest online retailer. They sell almost everything that is available online. 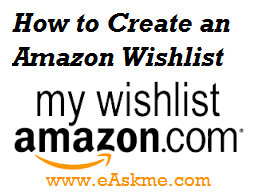 Amazon allow its users to make wishlists to make shopping experience easy. They can share this list with family and friends also. Create Account or if you already have account on Amazon then Login. Browse website to find the products you are looking for. When you find product then add to your wishlist. Click on "Add to Wishlist" button. Now on the next page create wishlist profile. View wishlist by clicking on "Wish list". You can deleted wishlist chane priority and move them to shopping cart. You can even sort items by date or category on your wishlist. Share your wish list with your family and friends by clicking on "Share with Friends" link. Now enter email addresses of people you want to send wish list you can also enter a personalize message. Do ask any question you have in comments and will will be glad to answer.